PARIS, Dec 15, 2011/ — A little bit retro, a little bit futuristic, the Louis Vuitton Spring/Summer 2012 advertising campaign is modernistic romance. In an intriguing echo of the previous season, the Louis Vuitton Spring/Summer 2012 advertising campaign once again takes up the narrative of the fashion show, continuing it from the point where the woman steps daintily off the pure white fairground carrousel and into the pastel pink paradise of a nearby ice cream parlor. Like the vintage limousines of the Fall/Winter campaign, this vastly different setting –painstakingly recreated in a New York studio, complete with a mouth-watering array of Chantilly-topped sundaes – provides the perfect showcase for the deliciously sweet, airy concoctions of Louis Vuitton’s Spring/Summer 2012 collection. “The spirit of our Spring/Summer 2012 collection is reflected beautifully in this new ad campaign,” says Marc Jacobs. broderie anglaise dresses, ladylike shifts embellished with strass, studs and 3D flowers, and sorbet colored suits with white lace collars. Accessories, too, feature prominently in the nine visuals, foremost among them the Lockit bag in sheer nylon voile that opened the runway show, the Speedy in powdered, whitewashed crocodile, and the pointed-toe mules in pastel shades with metal toe caps, dainty laces or rows of tiny buttons. 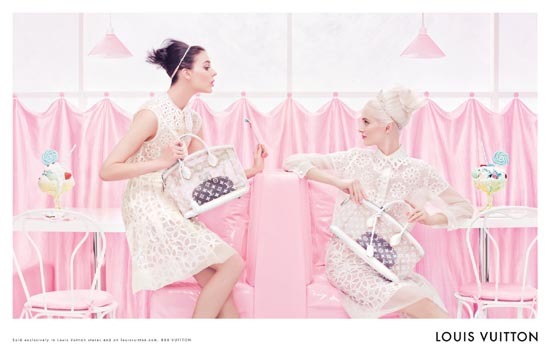 The Louis Vuitton Spring/Summer 2012 advertising campaign will break in the February 2012 issues of magazines worldwide.